Three years after making aliyah, and after living in Shilo for one year, I decided I wanted to build a house there. The choice of Shilo was based upon its historical significance, its central location (after all, it was the capital of Israel for 369 years), the beautiful scenic views shared by other Shomron communities, and the warm and wonderful nature of the families living there. Although any community of just a few thousand souls is going to have something of a small-town mentality, I found the residents of Shilo to be more cosmopolitan and outward-looking than in other comparable-sized yishuvim. My motivation for building my own house rather than buying an existing one was to have a house that would be comfortable, to my specifications, and avoid some of the problems I found in the houses I previously had rented. I was determined that the house, from start to finish, would be built with only Jewish workers, a difficult, but, as I proved, not impossible task. I am unclear whether to say anything about the legality of building a house in Yesha. The reason it may not be worthwhile discussing the legality of building a house in Yesha is that the meaning of word "legal" when used in reference to things in Israel is different from what the word means, for example, to the average American. For example, everyone has read about the so-called "illegal Israeli settlements". The only thing that makes them allegedly illegal is that they were built after the year 2001, when the Israeli Prime Minister told the American President he wouldn't build any more settlements, even though his promise was never solidified in any binational treaty, nor codified in any Israeli law passed by the Knesset. Clearly, in this case, the word "illegal" is being abused. By the same distorted reasoning declaring settlements built after 2001 illegal, you could argue that my house also is illegal, since it was built after the Israeli Prime Minister's promise. When I started to build my house, I decided to try to obtain all permissions I was informed about, but not to worry about whether I actually received them. 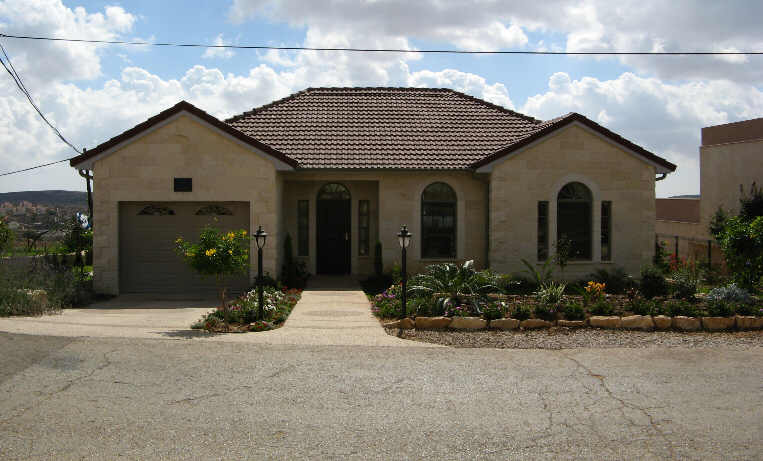 The house was appoximately half-built by the time I received final permission to build it, but my electricity connection was delayed six months after the Defense Minister, Amir Peretz, unilaterally decided during the course of my construction that an additional form had to be completed before electricity could be supplied to newly constructed houses. During the construction process, I made a small list of words I found useful in understanding what was going on. I can guarantee you that building a house will, out of necesssity, do wonders for your Hebrew vocabulary, but I can also say with nearly equal certainty, that it undoubtedly will do little to improve your equanimity. The oleh will need much help, aside from vocabulary, if he or she attempts to build a house anywhere in Israel.